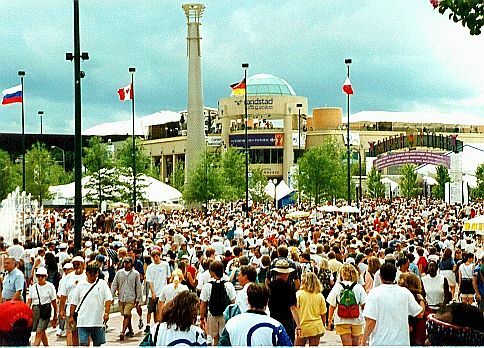 This was the scene at Centennial Olympic Park. There was plenty of things to do in Atlanta other than attending sporting events. There was eating and drinking and dancing in the streets. Everyone was having a great time! 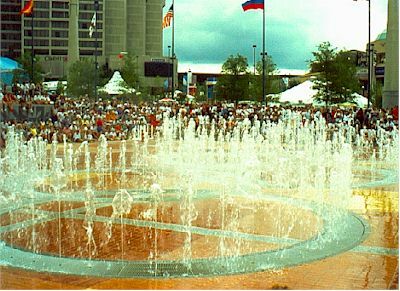 One of the most popular features of Centennial Park were the Olympic Ring Fountains. There were many hot and tired revelers that took advantage of the cool water. Unfortunately, the Park achieved notoriety after the terrorist incident that left one visitor dead and many injured. It was one of Atlanta's darkest moments.